Amidst the hectic coming and going of the people in Milan (which is nothing compared to other European big cities, let’s be honest, but still, it’s Italy, we always need a bit of context), this little Sicilian corner stands out for being veeery calm, cozy, funny, warm, in the end: delicious. 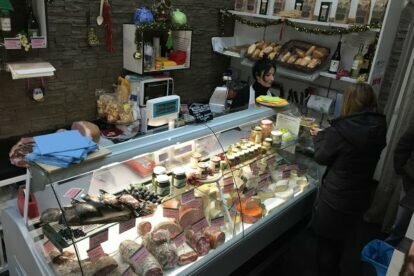 They are a little niche grocery where you can find many different products from southern Italy; the owners come from Sicily but they have farmers send them local products from Campania, Calabria and often other southern regions. For grocery shopping you can buy slices of prosciutto or soppressata, salami and other cured meats or types of cheese, by the pounds. Yet panini play a major role here, since it is located in the middle of a very busy district and many Italian workers often decide to have their lunch break here. When I have less than half an hour for lunch a sandwich is what I need; the ingredients could be anything you can see on the counter, plus they have a nearby cook who takes care of the hot dishes. It has never disappointed me, even after dozen of times. Letting the owner (Emilio) offer you a glass of red wine, as you taste the panino, and watching him smile beneath the white mustache, as he notices you are pleased by the experience, it is the cherry on top.